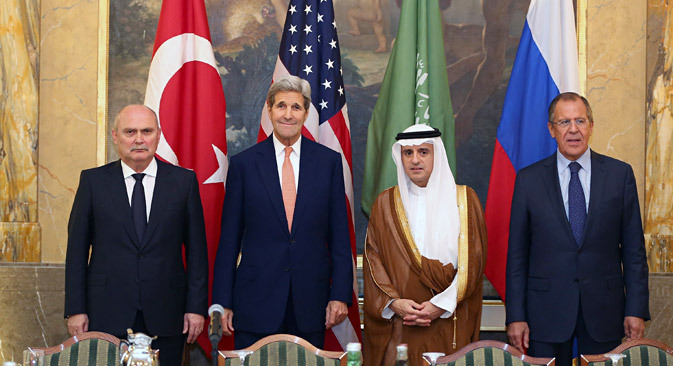 AUSTRIA, Vienna : VIENNA, AUSTRIA - OCTOBER 23: (L to R) Turkish Foreign Minister Feridun Sinirlioglu, US Secretary of State John Kerry, Saudi Arabia's Foreign Minister Adel al-Jubeir and Russia's Foreign Minister Sergey Lavrov pose for a photo in Vienna where they meet to discuss the Syrian conflict on October 23, 2015. The Quartet condemned "all acts of terror and violence against civilians"
The Quartet on the Middle East (Russia-U.S.-EU-UN) has voiced its concern about the continuing violence between Israelis and Palestinians. "The Quartet expresses grave concern over the continuing escalation of tensions between Israelis and Palestinians," the Quartet said in a joint statement on Oct. 23. The Quartet meeting participants condemned "all acts of terror and violence against civilians." The Quartet also called "for maximum restraint and avoidance of provocative rhetoric and actions. The Quartet on the Middle East has called on the Israeli authorities to work together with Jordan to guarantee the current status of the holy sites in Jerusalem. The Quartet "encourages Israel to work together with Jordan to uphold the status quo at the holy sites in Jerusalem in both word and practice, recognizing the special role of Jordan as per its peace treaty with Israel," the statement says. The Quartet members acknowledge that "security measures alone cannot stop the cycle of violence" in the Middle East and therefore call "for significant steps to be taken, consistent with the transition contemplated by prior agreements," the statement says. In particular, the Quartet considers it necessary "to restore confidence and hope in the viability of a negotiated two-state solution that resolves the final status issues, including that of Jerusalem, and ends the occupation that began in 1967."